As mentioned previously, I believe the prevailing theories of astronomy are consistent with the Biblical doctrine of creation. See chapter 10 for further discussion of this point. On the preceding pages, we considered the earliest stages of God’s creative work. He brought the universe into existence in a brilliant flash of energy, then stretched out the heavens to cool the blazing conflagration into hydrogen gas, and finally used gravity to shape hydrogen gas into stars and galaxies. That was just the beginning of His creativity, however. As we’ll see in what follows, the stars played an important role in God’s providential plan to create a habitat for life. Biological life requires a planetary home and a diversity of chemical elements, neither of which were available in the early universe. (As you may recall from earlier in this chapter, the period of nucleosynthesis that occurred shortly after the Big Bang did not last long enough to convert much hydrogen into heavier elements.) To understand the processes God ordained to prepare a home for living creatures, we must examine what happens when stars grow old and die. Convection currents carry hotter material from the sun’s interior to the surface, which is continuously erupting with huge flares as superheated plasma bursts out like bubbles in a pot of boiling water. Because plasma is electrically conductive, the sun is also roiling with powerful electric and magnetic fields that produce mesmerizing effects. Credit: The SDO Team, Genna Duberstein and Scott Wiessinger This video is in the public domain, and can be downloaded here. Initially, hydrogen burning occurs near the center of the star, where the pressure and temperature are greatest. Radiation and convection currents carry heat to the surface, where the plasma cools slightly as it releases energy in the form of light. Stars in this early phase of life are called main sequence stars because they lie along a curve called the “main sequence” in a Hertzsprung–Russell diagram—a chart that astronomers use to classify different types of stars. The main sequence phase of a star’s life takes a long time, typically billions of years. The sun has been burning for nearly five billion years and is barely halfway through its supply of hydrogen! Eventually, however, the hydrogen fuel is depleted. What happens next depends on the mass of the star. 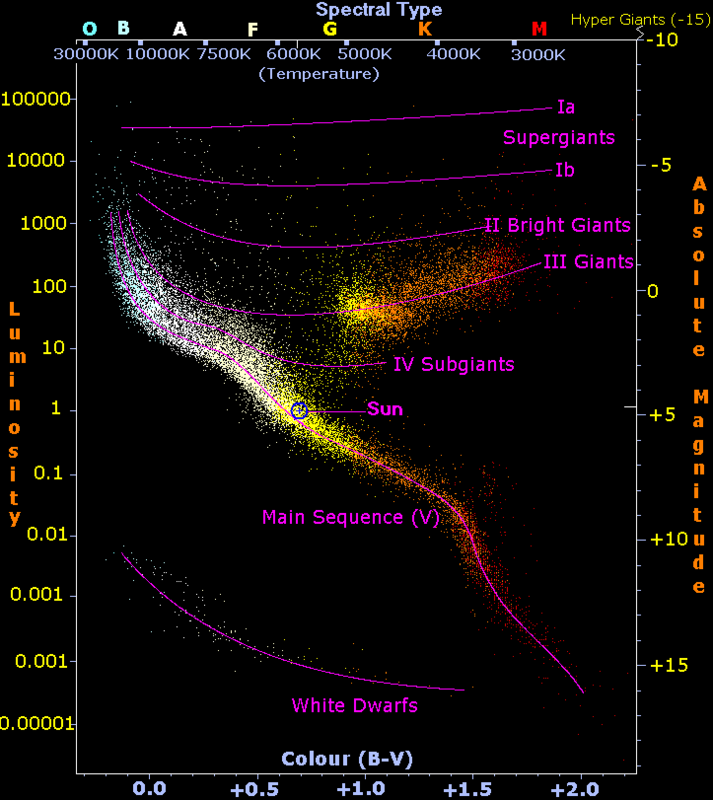 A Hertzsprung-Russell diagram is used to classify different types of stars. The vertical axis represents luminosity (absolute brightness). The horizontal axis represents the color index (spectral class), which indicates a star’s surface temperature.The temperature of an object determines the colors of thermal radiation it emits, as we saw in chapter 2. Each dot on this graph represents a star whose luminosity and color index have been measured. Credit: Richard Powell, Creative Commons (CC BY-SA 2.5) Image available via Wikimedia Commons. The mass of a star is often expressed in units called solar masses. One solar mass is equal to the mass of the sun, about 1.99 × 1030 kg. The least massive stars are red dwarfs, which range from about 0.01 to 0.5 solar masses—in other words, 1% to 50% the mass of the sun. Because red dwarfs have relatively little mass, their internal temperature and pressure are barely high enough to sustain nuclear fusion. The conversion of hydrogen to helium happens slowly, so slowly that a red dwarf star could last trillions of years without running out of fuel! No one knows for sure what happens to a red dwarf when it runs out of fuel, because that has never been observed: even the oldest red dwarfs still have plenty of hydrogen left. 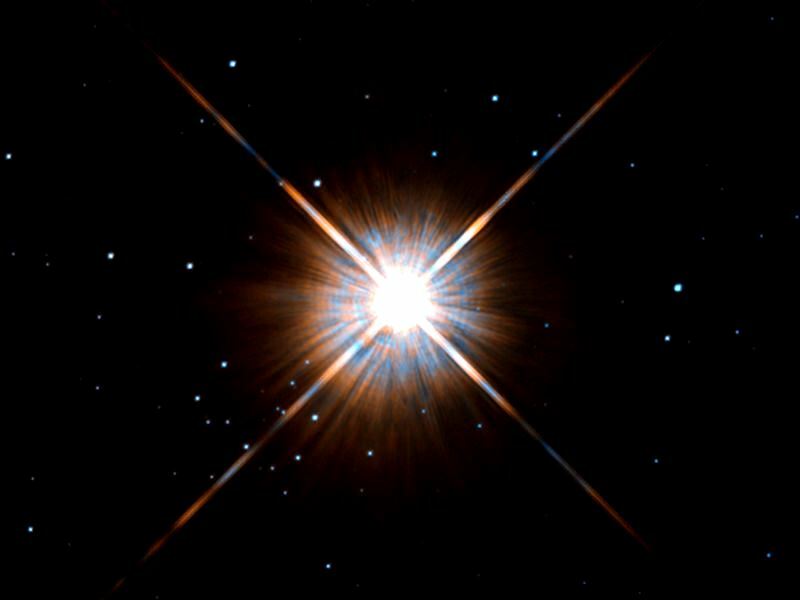 The nearest star, Proxima Centauri, is a red dwarf. Though it is only four light-years away, it is too dim to see without a telescope. Red dwarfs are the most common stars in the galaxy, but not a single one is visible to the naked eye. Credit: ESA/Hubble & NASA, Creative Commons (CC BY 4.0)Contrast adjusted. Original image available via Wikimedia Commons. Some carbon atoms also fuse with helium to form oxygen; and if the star has enough mass, still heavier elements may be formed. These reactions happen quickly and release tremendous bursts of energy. The dying star begins to convulse and blasts away its outer layers, exposing the small but intensely hot core. Clouds of expelled gases expand outward from the star, driven further into space by stellar wind. The result is a small nebula called a planetary nebula. Planetary nebulae have nothing to do with actual planets, but they looked like planets to the astronomers who first observed them through low-powered telescopes in the eighteenth century. When the outer layers of the star have dissipated into space, only the bare core remains. At this stage, the star is called a white dwarf. A white dwarf is a million times smaller (by volume) than the sun—about the size of Earth—yet it is so densely compressed that it can weigh up to 1.4 solar masses. The star is “dead” in the sense that all of the nuclear reactions have run their course, yet it continues to shine for millions or billions of years as energy from the leftover heat gradually radiates away. 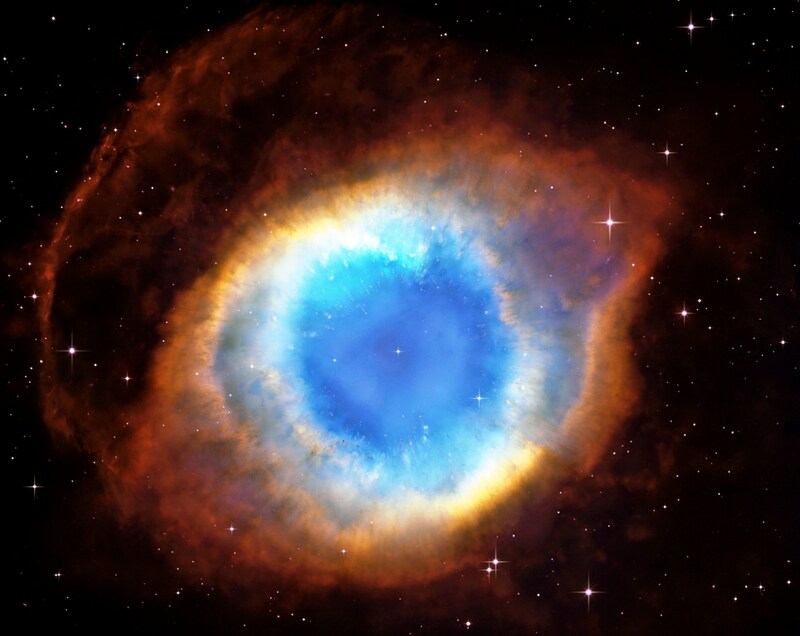 Nicknamed the “Eye of God,” the Helix Nebula is one of the closest planetary nebulae. The eye-shaped cloud of dust and gas is being expelled from the central star as it transitions from red giant to white dwarf. The blue color in the central region is oxygen fluorescing in ultraviolet light from the star. The reddish colors near the edges come from hydrogen and nitrogen.For more information about the Helix Nebula, see here. Credit: NASA, ESA, and C.R. O'Dell (Vanderbilt University) This composite photo was created from images taken by the Hubble Space Telescope in 2003. The original photo is here. I have adjusted the colors slightly to match this visible-light photo taken by a ground-based telescope. I also added lens flare effects to some of the stars. That’s the typical fate of a star between 0.5 and 8 solar masses: they throw off their outer layers at the end of the red giant phase, then slowly fade out as white dwarfs. Stars heavier than eight solar masses do something a little more dramatic: they tend to explode before reaching the white dwarf stage! White dwarf stars can also explode under certain conditions. Both types of explosions produce the heavier elements needed to make the universe a suitable habitat for life, as we’ll see on the next page.